James Joyce was born on 2 February 1882 in Dublin, Ireland. Born as James Augustine Aloysius Joyce in a modest Catholic family, he was sent to a boarding school at the age of six. In, 1892 he left school, as his father was unable to pay the fees. In 1893, he got accepted by the Belvedere College where he studied, until he joined the University of Dublin in 1898. He studied English, French and Italian. Joyce was a serious reader, writer and language lover. At a young age he read Dante and Aristotle, and as an autodidact, he taught himself Norwegian so he could read Henrik Ibsen’s works. In 1900, he wrote a review about Insen’s When We Dead Awaken which compelled the author to send Joyce a thank you note. Besides Norwegian, Joyce went on to speak and read 17 languages such as Sanskrit, Danish, Arabic and Greek among them. After he graduated in Dublin, Joyce moved to Paris with the hope of pursuing his further studies. However, his mother fell sick and he left Paris and came back to Dublin. In 1904, James Joyce and his girlfriend – Nora Barnacle – moved to Italy, in the city of Trieste. They spent most part of their lives in Italy and Paris. In 1914, at a time when Irish nationalism was at its peak with national identity becoming a discussion in every walk of life, Joyce published Dubliners, followed by A Portrait of the Artist as a Young Man in 1916, which has been voted by the Modern Library as the third best novel every written. In 1922, Ulysses was published, after it was serialized in The Little Review magazine. His final novel, Finnegans Wake was published in 1938, three years before he passed away. James Joyce made an enormous contribution to English Literature and especially the modernist movement. His works have been praised and ranked as the finest in literature. Together with the authors of The Lost Generation, he invented new style of writing and structures in order to paint the human and cultural experience during and after World War I.
Joyce works have contributed to the development of literature and to the novel as an art form, especially the model of stream of consciousness. 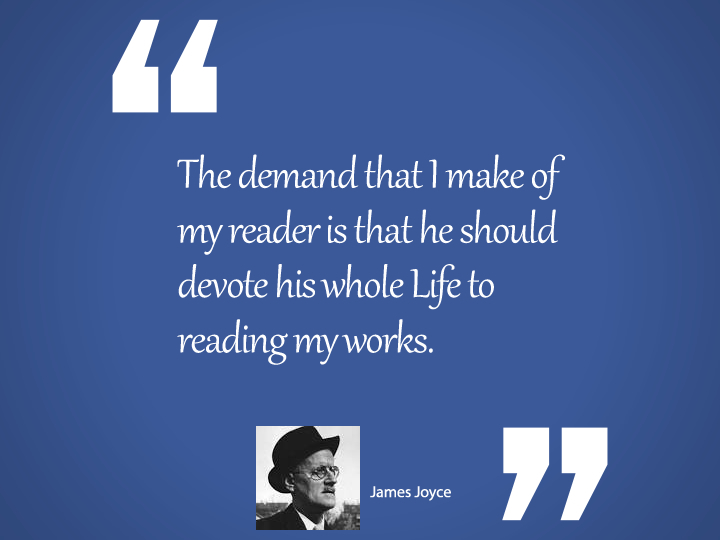 We, as readers, should devote our time and life to reading his works. Well and what’s cheese? Corpse of milk. I think a child should be allowed to take his father’s or mother’s name at will on coming of age. Paternity is a legal fiction. I’ve put in so many enigmas and puzzles that it will keep the professors busy for centuries arguing over what I meant, and that’s the only way of insuring one’s immortality. Men are governed by lines of intellect – women: by curves of emotion.